In his research, Markus Koch, Associate Professor at the Institute of Experimental Physics of Graz University of Technology (TU Graz), concentrates on processes in molecules and clusters which take place on time scales of picoseconds (10^-12 seconds) and femtoseconds (10^ -15 seconds). Now Koch and his team have achieved a breakthrough in the research on completely novel molecular systems. By means of femtosecond spectroscopy, which allows ultrafast processes to be measured in a time-resolved way, the Graz researchers were able to exactly describe the processes in an approximately five-nanometer sized superfluid helium droplet after photoexcitation of an atom inside. This milestone in basic research has impact on the experimental investigation of atoms and molecules. Markus Koch explains the pioneering approach: "Our institute, headed by Wolfgang Ernst, has a long tradition in the production and investigation of novel systems and clusters in a nanometer-sized quantum fluid. We are now combining this expertise with femtosecond spectroscopy. This allows us to observe and measure processes, which are triggered by photoexcitation in real time and to describe their dynamics. We are the first research group who has observed this." The results of the research have just been published in Nature Communications. 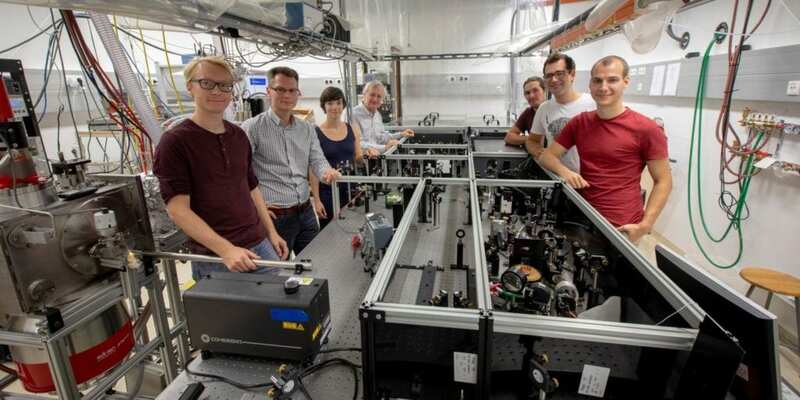 To investigate this fundamental process which takes place on an ultrashort timescale of only one trillionth of a second, the team led by Markus Koch applies femtosecond spectroscopy. The femtosecond pump-probe method provides snapshots of atomic movements. For the experiment, a single indium atom is introduced into a tiny helium droplet. The indium atom is subjected to pump excitation by means of a short pulse and subsequently transfers energy to the surrounding helium, which starts to oscillate collectively. A time-delayed second flash of light then probes the system in order to observe the dynamics. Bernhard Thaler, a PhD student at the Institute of Experimental Physics who is substantially involved in the pathbreaking research, explains what happens: "When we photoexcite the atom inside the helium droplet, its electron shell expands and the enveloping bubble increases within a picosecond after stimulation. We further observe that the indium atom is ejected from the droplet after about 50 to 60 picoseconds. We were able to obtain this mechanistic insight for the first time with the femtosecond experiment." A process characterised by superlatives: ultrafast movements on femtosecond timescales inside nanometer-sized helium droplets (which is less than one thousandth of the diameter of a hair), at an ultralow temperature of 0.4 Kelvin above absolute zero. The team was able to illustrate this process very clearly using simulation software. With this research success, Markus Koch and his team managed to prove impressively that the ultrafast, electronic and nuclear dynamics of particles inside superfluid helium droplets can be observed and simulated. Following this research success, Markus Koch is already looking into the future. "Today, we are still experimenting with single atoms," says Koch, "but after this proof of concept we are moving in giant steps towards the application of helium nanodroplets to investigate dynamics in previously unknown or fragile molecular systems of technological or biological relevance." The research of Markus Koch and his team was funded as a Stand-Alone Project by the Austrian Science Fund (FWF). This research project is anchored in the Field of Expertise „Advanced Materials Science", one of five strategic research FoE of TU Graz. Participating researchers are members of NAWI Graz – Natural Sciences.